Blowout Sale! 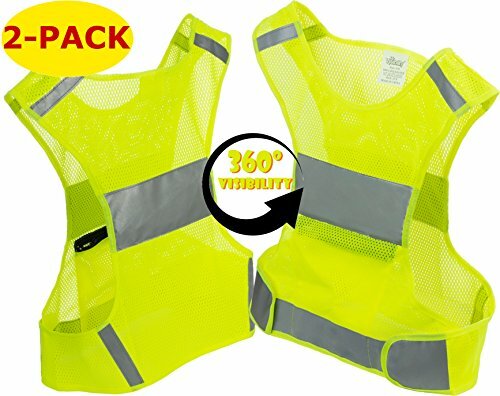 Save 52% on the Mr Visibility Reflective Vest for Running or Cycling (2 Pack) XL Size | Reflector Jackets with Pockets | High Visibility Safety Clothing for Bike, Walking, Runners | Security Gear for Women, Men by Mr Visibility at Cardio Fitness Plus. MPN: RVXL2P. Hurry! Limited time offer. Offer valid only while supplies last. Reflective Vest (2 Pack) with Zippered Pocket. High Visibility Outdoor Clothing. Safety Vest Reflective for Running, Cycling, Dog Walking, Jogging. ✅ BIG DEAL WITH 2x VEST PER PACK XL SIZE + BONUS OFFER - Set of two reflective vests for running or cycling. Take advantage of our 25% Discount on Mr Visibility Reflective Bands Set of 6 units, if purchase this reflector vest. Promo Code "BANDMV25" at checkout. A exceptional offer for saving money and provide safety to loved ones. This is a limited time offer!! ✅ 100% SATISFACTION GUARANTEE: Backed by our exclusive 1 Year Warranty and 30 Day Money Back Guarantee. DEAL OF THE DAY: Buy 2 & Save 5% (coupon REFMVES5 at checkout). Please, see below all our Special Offers and Product Promotions. Buy for a friend or loved one and save together!